A simple and reliable method on isolation and culture of neural stem cells from discarded human fetal cortical tissue is described. Cultures derived from known human neurological disorders can be used for characterization of pathological cellular and molecular processes, as well as provide a platform to assess pharmacological efficacy. Lu, J., Delli-Bovi, L. C., Hecht, J., Folkerth, R., Sheen, V. L. Generation of Neural Stem Cells from Discarded Human Fetal Cortical Tissue. J. Vis. Exp. (51), e2681, doi:10.3791/2681 (2011). Neural stem cells (NSCs) reside along the ventricular zone neuroepithelium during the development of the cortical plate. These early progenitors ultimately give rise to intermediate progenitors and later, the various neuronal and glial cell subtypes that form the cerebral cortex. The capacity to generate and expand human NSCs (so called neurospheres) from discarded normal fetal tissue provides a means with which to directly study the functional aspects of normal human NSC development 1-5. This approach can also be directed toward the generation of NSCs from known neurological disorders, thereby affording the opportunity to identify disease processes that alter progenitor proliferation, migration and differentiation 6-9. We have focused on identifying pathological mechanisms in human Down syndrome NSCs that might contribute to the accelerated Alzheimer's disease phenotype 10,11. Neither in vivo nor in vitro mouse models can replicate the identical repertoire of genes located on human chromosome 21. Here we use a simple and reliable method to isolate Down syndrome NSCs from aborted human fetal cortices and grow them in culture. The methodology provides specific aspects of harvesting the tissue, dissection with limited anatomical landmarks, cell sorting, plating and passaging of human NSCs. We also provide some basic protocols for inducing differentiation of human NSCs into more selective cell subtypes. Prepare 100ml dissection medium (KNOCKOUT DMEM/F12, Invitogen) ahead of time and refrigerate. Prepare100 ml culture medium (Stem Pro NSC SFM, Invitrogen) and keep at 37 °C in a water bath. Prepare cell-freezing medium (KNOCKOUT DMEM/F12+10%FBS+ 5%DMSO) for long term cryopreservation of cells. If desired, prepare 4% paraformaldehyde (PFA) for tissue fixation. Sterile, autoclaved forceps and scalpel blades with handles are used for dissection. Set aside a pipette gun, 10 ml transfer pipettes, and 40 μM cell strainer (BD Falcon 352340) for dissociation. Set aside several 10 cm culture dishes (BD) for dissection, 50 ml centrifuge tubes (BD) for dissociation, 1.5 ml centrifuge tubes for tissue storage and frozen vials (BD) for freezing cells. Harvesting of viable tissue immediately after termination of the fetus is vital to the success of the procedure. For elective procedures, timing to obtain samples can be arranged in advance so as to minimize time after fetal demise. The products of conception are harvested within 2 hours post procedure, but ideally can be achieved on elective procedures within minutes. The fetal tissues often are fragmented. However, in general a significant portion of the brain remains intact for visual identification. Limitations of gestational age (GA) are determined by statutory law but have been performed using this protocol between 18-22 weeks GA.
Fetal brain is placed in a 10 ml Petri dish containing ice-cold KNOCKOUT DMEM/F12 solution. Identify different parts of the cortex by anatomical landmarks. Boundaries for the frontal and parieto- occipital cortices are oriented by the extrapolated intersection of the central sulcus and sylvian fissure. Dissect tissue from the frontal cortex anterior to the central sulcus and along the border of the sylvian fissure with surgical blades, making sure to keep the ventricle intact and undamaged. Remove any residual blood and meninges from the separated block of frontal cortex. If the sample is of sufficient quality, it is ideal to dissect the block into several smaller samples for various purposes: sections (fixed in 4% paraformaldehyde, PFA) and protein/mRNA assays (fast frozen in -80°C). Transfer the selected brain block to a 50 ml centrifuge tube, and add ice-cold KNOCKOUT DMEM/F12 solution at about 3 times of the tissue’s volume. Gently dissociate the tissue by mechanical pipetting with a 10 ml transfer pipette until all the tissues becomes fragmented (generally 20-30 times), and then filter the cells through a 40 μM cell strainer (BD Falcon 352340) to obtain single or near single cell suspension. Centrifuge the cell suspension at 2000 rpm and room temperature for 5 min, resuspend the cell pellet in 10 ml fresh warm culture medium (Stem Pro NSC SFM), and count the cell number with a hemocytometer. Add 5 ml warm culture medium into each 25 cm2 culture flasks, and transfer 2X106 cells to each flask. Cultures are maintained in a 37°C/5% CO2 incubator for 1 week before the analysis. Change half the medium once a week for further cultures or experiments. Neurospheres usually form in 1 to 2 weeks under the recommended culture conditions with NSC diameter ranging between 200 and 400 μm. Neurospheres at this stage can be dissociated with 0.2 g/L EDTA in calcium and magnesium free Hanks medium (Hanks) at 37°C for 15 min to obtain single cells. Cells suspension are spun at 2000 rpm, rinsed in fresh Hanks, and replated in warm culture medium for subculture. To initiate differentiation, dissociated cells are plated on poly-D-lysine/laminin 1 coated coverslips at a density of 1X105 cells per coverslip (24mmX24mm). Oligodendrocyte differentiation is achieved by maintaining the cells in KNOCKOUT DMEM/F12 (Invitrogen, Main, MD)+2% B27(50X, Invitrogen, Main, MD)+10ng/ml bFGF+100ng/ml SHH+ 10ng/ml PDGF-AA for 2days, then switching to the same medium without growth factors for another 5 days. Neuronal differentiation is achieved by maintaining cells in KNOCKOUT DMEM/F12 +2% B27 (50X) for 7 days. Astrocyte differentiation is done by culturing cells in KNOCKOUT DMEM/F12 +1%FBS for a week. Transfection of neural stem cells with genes can be done with dissociated cells from the preformed neurospheres. Here, we showed the neural stem cells transfected with EGFP-C1 by electroporation. The electroporation of EGFP-C1 construct was done using AMAXA Nucleofector Kits for Mouse Neural Stem Cells (VPG-1004) with AMAXA Nucleofector Device (Lonza AAD-1001), following the company’s instruction. In short, 5 μg DNA with 1 X 106 cells were mixed with 100 μl transfection medium, and after pulse electroporation, the cells were resuspended in the neural stem cells maintaining medium for further culture. The differentiation of transfected cells were processed with the dissociation of neurospheres 3-4 days after the electroporation, following the same procedures described in step 3.2. Dissociated cell suspensions are centrifuged and resuspended in freezing medium with a concentration of 1X107 cells/vial/ml. Slowly freeze the cells in -20°C, -80°C then transfer to liquid nitrogen for long time storage. The cells are fast thawed with 37°C water bath and resuspended in warmed DMEM/F12+10% serum for a wash, centrifuged to remove the freezing medium, and resuspended in the warmed culture medium. Neural stem cells from a normal fetus at 18 weeks gestational age were cultured following the described methods and neurospheres can be seen after one week with round, smooth borders and fairly homogenous size (Fig.2A). These neurospheres can be transfected with EGFP-C1 or other constructs and followed under fluorescence microscopy (Fig.2B,). Established neurospheres were then dissociated with EDTA and plated as dispersed cells on coated coverslips. Cells differentiated under the respective protocols were fixed with 4% parafamaldehyde, and stained with different cell type specific markers. Multipotentiality is observed with expression of markers indicative of neurons (Fig2C, D, rhodamine) astrocytes (Fig2E, F, rhodamine) and oligodendrocytes (Fig2G, H, rhodamine). The cells not undergone electroporation of EGFP were also differentiated into different cell types and stained with different cell specific markers. Multipotentiality is observed with expression of markers indicative of neurons (Fig3A, B, fluoroscein) astrocytes (Fig3C, rhodamine and Fig3D, fluoroscein) and oligodendrocytes (Fig3E, F, rhodamine). Figure 2. Undifferentiated and differentiated human neural cells propogated in vitro. (A) Neurospheres are shown under phase contrast microscopy demonstrate smooth, round borders and rapid growth after culture for over 1 week. (B) Introduction of various plasmids and constructs can be achieved through transfection. Three days following EGFP-C1 transfection, multiple cells show expression of the green fluorescent protein as seen under fluoroscein immunostaining and fluorescence microscopy. 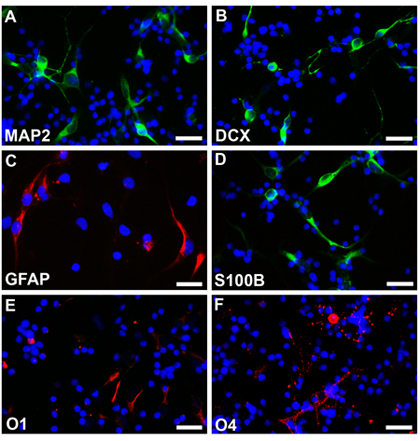 EGFP-C1 transfected neurospheres are dissociated and differentiated under different conditions into neurons (C, D), astrocytes (E, F) and oligodendrocytes (G, H) and seen under rhodamine fluorescence. Concurrently, transfected EGFP positive cells are shown under fluoroscein fluorescence. Transfected cells (white arrow heads) are indistinguishable from untransfected cells (white arrows). The cell nuclei are stained with Hoechst33342. Scale bars are 200 μm for A, 100 μm for B and 25 μm for C-H. Figure 3. 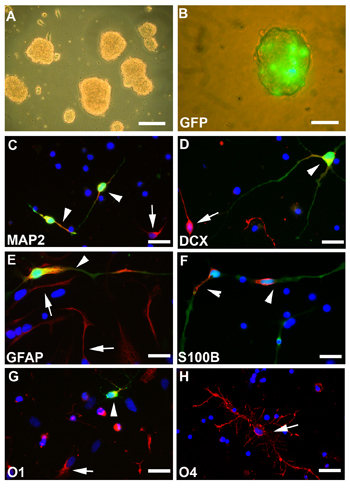 Neurospheres without transfection are dissociated and differentiated under different conditions into neurons (A, B, fluoroscein), astrocytes (C, rhodamine, D, fluoroscein) and oligodendrocytes (E, F, rhodamine). The cell nuclei are stained with Hoechst33342. Scale bars are 25 μm for A-F. There are various approaches toward culture fresh tissue and producing human cell lines. Historically, fresh tissue has been harvested and cultured immediately to generate various cell types in the central nervous system. This approach however is clearly limited by the number of samples that can be obtained- which in the case for human samples, is usually quite small. Given the minimal degree of manipulation, freshly cultured neural cells provide the most reliable experimental system by limiting potential artifacts from extended culturing. The limited supply led to a second approach of generating human cell lines that had been immortalized through insertion of various oncogenes 12, 13. The concern for this approach lay in the possibility that oncogenic manipulation of these cells would alter the cell properties. Additionally, part of the rationale for generating human cell lines was the potential for transplantation and treatment of various human disorders. Immortalized cell lines could predispose to the risk of cancer growth. The advantage to these cell lines is the uniformity of the lines, their ability to adopt the various neuronal and glial phenotypes inherent in a region of the brain, and the ease of generating large number of cultures. To overcome the potential oncogenic limitations, various approaches have been used for culturing primary human neural stem cells. Most methods are based on EGF and bFGF manipulation of cells, with adhesion or suspension culture techniques. These different approaches result in different purities of NSC 14. Svendsen et al. reported a method of NSC culture by section of formed neurospheres with the cell–cell contacts maintained (15), which can give a rich production of NSC in a short time. However, oligodendrocyte can not be obtained with these neurospheres at later passages. Enriching neurospheres with EGF and bFGF can also alter the transcriptional and cellular phenotypes in vitro 14. Use of early passage cultures provides a reasonable compromise between the need for large numbers of cultures and the least concern for introduction of culture artifact. Most recently, advances have been made in the generation of induced pluripotent stem cells by forced expression of a subset of genes required to maintain stem cell properties. IPS cells have the advantage of providing large quantities of human cells as well as the potential to generate all different types of cells that comprise the human body. Currently, this last advantage also makes this model system less appealing in that the signaling mechanisms to transform cells to a particular cell type (i.e. forebrain neurons) are not known. The current methods described for generation of human NSCs provide some slight variations from other published approaches. Most previous methods use various enzymatic or chemical means of cell dissociation (trypsin or papain) to dissociate the NSC from fetal cortex. In general, given the large quantity of tissue, we use gentle mechanical trituration with fine cell filtration to obtain viable single cells which have undergone minimal manipulation. Moreover, this approach minimizes the time from tissue harvest to tissue culturing/ storage, which is critical for human samples. This protocol describes how to isolate human neural stem cells from discarded frontal cortical tissue 7,9,10,11. The methodology for isolating the neurospheres varies slightly between human and mice, with the approach described here optimized for obtaining single- cell suspensions in human tissue samples. There are several considerations in the use of human tissue. First and foremost is limiting the time after fetal demise prior to onset of cell dissociation and harvesting. This problem can be mitigated by prior scheduling of elective abortions and maintaining samples at 4°C. Second, it is important to try to identify landmarks for dissociation of the cortical tissue. Toward this end, it is useful to inform the physician performing the abortive procedure to try to maintain brain integrity when possible. Third, it is important to realize that the scale of the human fetal brain even at 18-22 weeks far exceeds that of even an adult mouse or rat and therefore, the need to perform the dissociation, filtration, and washing with a larger throughput system (i.e. larger plastic ware, 10 ml plastic pipets vs glass polished pipets, multiple samples processed in parallel). Fourth, the cells are mechanically dissociated and it is not necessary to make sure all the tissue fragments are gone. Rather it is preferable to minimize trituration as much as possible, with the understanding that filtration will remove the unwanted larger tissue fragments and separate enough individual NSCs from the larger sample for culturing. Fourth, the reagents chosen are optimized for human neurospheres. Finally, one should try not to disturb individual cells after they are plated, so as to minimize aggregation. Once the human neural stem cells have formed clonal spheres, they can be dissociated into single cells as described above, and passaged to ascertain self-renewal capabilities or differentiated into the different cell types using different combinations of growth factors and/or proteins. This work was supported in part by the National Institutes of Health: HD054347 and NS063997-01 to VLS. This work was also supported in part by the Empire State Stem Cell Fund through the New York State Department of Health Contract #C024324 to VLS. The opinions expressed here are solely those of the author and do not necessarily reflect those of the Empire State Stem Cell Board, the New York State Department of Health, or the State of New York. VLS is a Doris Duke Clinical Scientist Developmental Award Recipient. We also thank Professor Timothy Vartanian for his gift of Anti-O1, Anti-O4 antibodies. Gage, F. H., Ray, J., Fisher, L. J. Isolation, characterization, and use of stem cells from the CNS. Annu. Rev. Neurosci. 18, 159-192 (1995). Vescovi, A. L., Snyder, E. Y. Establishment and properties of neural stem cell clones: plasticity in vitro and in vivo. Brain Pathol. 9, 569-598 (1999). Schwartz, P., Bryant, P., Fuja, T., Su, H., O'Dowd, D., Klassen, H. Isolation and characterization of neural progenitor cells from post-mortem human cortex. J Neurosci Res. 74, 838-851 (2003). Martinez-Serrano, A., Rubio, F. J., Navarro, B., Bueno, C., Villa, A. Human neural stem and progenitor cells: in vitro and in vivo properties, and potential for gene therapy and cell replacement in the CNS. Curr Gene Ther. 1, 279-299 (2001). Rajan, P., Snyder, E. Neural stem cells and their manipulation. Methods Enzymol. 419, 23-52 (2006). Ruiz-Lozano, P., Rajan, P. Stem cells as in vitro models of disease. Curr Stem Cell Res Ther. 2, 280-292 (2007). Sheen, V., Ferland, R., Harney, M., Hill, R., Neal, J., Banham, A., Brown, P., Chenn, A., Corbo, J., Hecht, J., Folkerth, R., Walsh, C. Impaired proliferation and migration in human Miller-Dieker neural precursors. Ann Neurol. 60, 137-144 (2006). Bahn, S., Mimmack, M., Ryan, M., Caldwell, M., Jauniaux, E., Starkey, M., Svendsen, C., Emson, P. Neuronal target genes of the neuron-restrictive silencer factor in neurospheres derived from fetuses with Down's syndrome: a gene expression study. Lancet. 359, 310-315 (2002). Ferland, R. J., Batiz, L. F., Neal, J., Lian, G., Bundock, E., Lu, J., Hsiao, Y. C., Diamond, R., Mei, D., Banham, A. H. Disruption of neural progenitors along the ventricular and subventricular zones in periventricular heterotopia. Hum Mol Genet. 18, 497-516 (2009). Esposito, G., Imitola, J., Lu, J., De Filippis, D., Scuderi, C., Ganesh, V. S., Folkerth, R., Hecht, J., Shin, S., Iuvone, T., Chesnut, J., Steardo, L., Sheen, V. Genomic and functional profiling of human Down syndrome neural progenitors implicates S100B and aquaporin 4 in cell injury. Hum Mol Genet. 17, 440-457 (2008). Esposito, G., Scuderi, C., Lu, J., Savani, C., De Filippis, D., Iuvone, T., Steardo, L. J. r, Sheen, V., Steardo, L. S100B induces tau protein hyperphosphorylation via Dickopff-1 up-regulation and disrupts the Wnt pathway in human neural stem cells. J Cell Mol Med. 12, 914-927 (2008). Flax, J. D., Aurora, S., Yang, C., Simonin, C., Wills, A. M., Billinghurst, L. L., Jendoubi, M., Sidman, R. L., Wolfe, J. H., Kim, S. U., Snyder, E. Y. Engraftable human neural stem cells respond to developmental cues, replace neurons, and express foreign genes. Nat Biotechnol. 16, 1033-1039 (1998). Fults, D., Pedone, C. A., Morse, H. G., Rose, J. W., McKay, R. D. Establishment and characterization of a human primitive neuroectodermal tumor cell line from the cerebral hemisphere. J Neuropathol Exp Neurol. 51, 272-280 (1992). 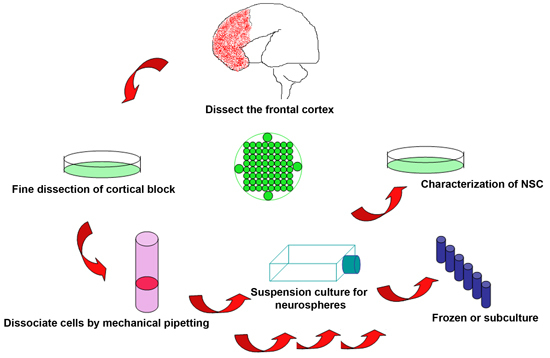 Conti, L., Cattaneo, E. Neural stem cell systems: physiological players or in vitro entities? Nat Rev Neurosci. 11, 176-187 (2010). Svendsen, C. N., ter Borg, M. G., Armstrong, R. J., Rosser, A. E., Chandran, S., Ostenfeld, T., Caldwell, M. A. A new method for the rapid and long term growth of human neural precursor cells. J Neurosci Methods. 85, 141-152 (1998).